1. Attend an upcoming FERC public meeting to voice your support of Atlantic Sunrise. 2. By June 27, 2016, sign this letter to FERC expressing your support during the public comment period of the DEIS review. 3. By June 27, 2016, submit your own supportive comment directly to FERC. Click on box in top right-hand corner of page to register to submit a comment, and use Docket No. CP15-138-000. 4. BONUS: You can also sign up for important updates on Atlantic Sunrise. You guys might spend all of five minutes and make your voices heard. These anti fossil fuel people are woefully short on accurate facts ... but they more than compensate with their passionate zealotry. The stakes are enormous for your children and grandchildren. Or, you all can knit heavier sweators for your kids to wear around the house like they are proudly doing up in Massachusetts. (They just shot down some VERY badly needed pipelines). The anti's voice is loud, and heard often. Our voice is muted, quiet, and dull. Although even I am hit with the 'why bother' bug at times, in regards to pipelines, if we do not, as individuals, take a few minutes to voice our support, only one side gets heard. If you have clicked on the link and supported the Atlantic Sunrise, please come back and confirm on this chain. We all know that seeing others say they are in can start an avalanche of activity. The anti's are attacking all of us at the Pipelines. If you have any interest at all, please take a few minutes today. And let us all know you signed the letter. We all have plenty of complaints out here on the blog. 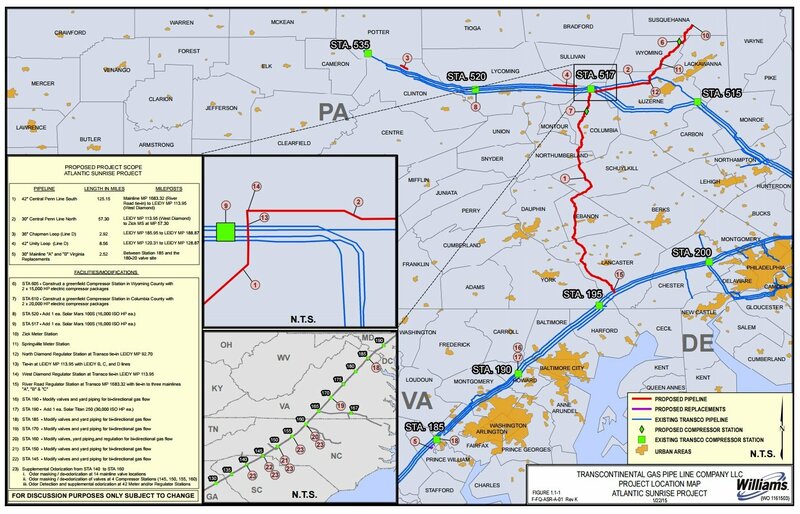 Here is a chance for you to support a pipeline directly with FERC. The way the Appalachian Basin Landowners are being paid a royalty today (little to none) indicates that the O&G industry has decided to bull doze us over and leave us poor in the center of an O&G cesspool. It would be wise to dig your heals in by not co-operating and let the O&G companies know that if they don't pay us a fair royalty then they won't get all of their money making projects built in and through our neighborhoods. Lets leave it in the ground until the US decides Land Owners not only Own their minerals, they should be paid fairly for them. Anyone who disagrees doesn't own land in the Appalachian Basin, they want what we have and will try to convince us this is what we need, when it's actually what they need to take what we have. hold your breath philosophy Ron? no one cares. Sit back, complain, and do nothing. How's that going for you? Signing your name to a letter, takes 5 minutes. If you did it, and you emailed 25 people, before you know it, we have 50,000 people signing the letter. U think people at FERC wont take notice? U think people at the DEP won't take notice. Most importantly, you think state reps who are up for re-election wont take notice.............they only have a job if they get re-elected. The whole problem with apathy is that to actually see results, it takes an annoying amount of time to get each individual to actually believe that signing one letter matters. Once the 'group' understands that their 'collective voice' actually induces change, it begins to roar, albeit years away. Your choice to engage or not. The more people who do not, very difficult to hear your complains going forward if you can not take 5 minutes to sign a letter. Simple choice --- Remain part of the problem, or start to begin to be a part of the solution. In PA, they have known about the deduction issue for an easy two years. They would rather pass a 6.5% 'tax' then be on the side of their own citizens. U just had an anti get removed from office. The question is how did he get there in the first place? Yes, moving more gas helps everyone in the short run. So does 12.5% being 12.5%, but obviously the legislators are not helping us out either. Last i checked, Williams is not an E&P, thus they do not pay you any, or steal any of your royalties. In the amount of time you will spend complaining about deductions, you could have signed the letter, sent a letter to the DEP, and emailed everyone you know who cares about protecting the rights of mineral owners and asking them to sign too. Dont respond to this until you sign the letter. Commenting in support of the Atlantic Sunrise Pipeline as it fills a critical need to get natural gas to areas where it is most needed. The United States is the only country to come close to achieving the goals set in the Kyoto Protocols even though the US didn't sign the protocols. And the biggest reason we accomplished that is because of the switch to clean efficient natural gas, according to the federal EPA. And that reduction in greenhouse gases can continue as we replace more coal-fired electric generation plants. It would even be accelerated if we convert road tractors from diesel to nat gas as we use 40% of our oil on transportation. Our CO2 emissions are now at 1992-3 levels and can be further reduced as we transition to nat gas. But we need pipelines to get that gas to the proper markets, especially those along the heavily populated East Coast. Add in the jobs created, the royalties paid to land owners, the tax revenue generated, the supply of related constituents to the plastics, agricultural, and pharmaceutical industries. reducing our foreign trade imbalance, reducing our reliance on unstable foreign supplies of energy, cutting off finances to enemies across the globe, and the safety factor of shipping by pipeline over rail or trucking, the pipeline is a critical piece of infrastructure that will benefit every American. I think it is important to point out that we are the only country to achieve the Kyoto Protocol goals and we did mostly through the increased use of nat gas. That is something few people know. The nat gas industry should do a much better job of publicizing that fact. Esp that last one. Yes, currently, the nat gas industry, as a whole, have not done a great job joining forces, aggregating monies, hiring groups, and beating their chests of the positives that have developed, and are going to continue to develop over the coming decades. Emissions reductions, job growth, economic growth, exports, cracker plants, pipeline investments, and in the future, industrial growth! Yeah, they are running those foolish 'energy voter' ads in which they promote an 'all of the above' approach which means including wind and solar. Trying to look PC never wins support. They should promote nat gas as a bridge fuel while research on wind and solar continues. Nat gas will cut emissions by huge amounts and buy us time to perfect wind and solar. That will keep us strong economically while we make a gradual shift as it is more competitive. b/c of the volatility around nat gas the last 5 years, it seems the 'industry' is very fragmented at this time with really only T Boone Pickens being a steady, consistent voice. Industry wide groups are a challenge as many see each other as 'competitors' rather than the us vs them mentality. Unfortunately, this is yet another area that has allowed the anti's to gain traction in the media, while we fall farther behind.